Greetings friends! This summer has flown by! I can't believe it! We only have two more weeks of Bella's Summer Adventures and I can promise you that they are going to rock. 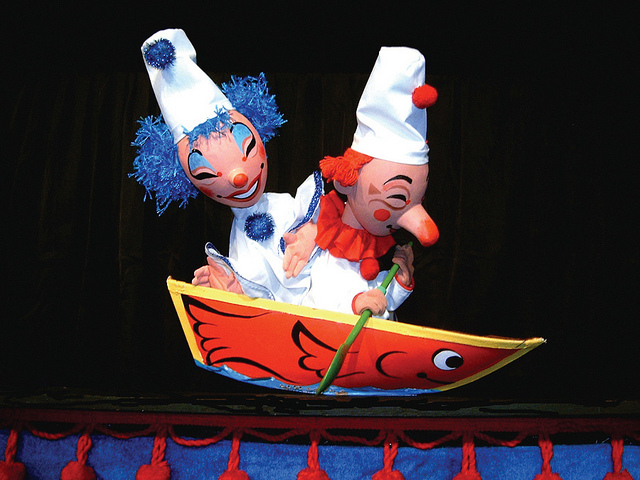 This week I'll be attending Clown Circus at Puppet Showplace Theater which is playing for just one day! Clown Circus was created by our former Artist-In-Residence, Paul Vincent Davis, and will be performed by our current Artist-In-Residence, Brad Shur. Me dressed up as a Clown!! Clowns come in all shapes and sizes, but everything about them is larger-than-life. Join Dusty and his friends Tarta, Zany and Pierrot for this fun, interactive variety show featuring circus-inspired singing, dancing, storytelling, lion-taming, and more. Original music and brightly-colored characters will delight our youngest audience members (and their grown ups!). Are you ready for colorful characters and silly shenanigans!? I can't wait to see the lion tamer! AND I can't wait to see YOU in the audience. Newer PostDIY Puppet Crafts: Make your own Pirate Finger Puppet!